Recorded on the 9th of March, 1969 at Fleetwood Studios, Revere, MA, USA. When Austin Wiggin, Jr. and his teenage daughters Dorothy, Betty, and Helen drove from their home in Fremont, New Hampshire to a recording studio in Revere, Mass. one day in the late 1960s, none of the participants could have guessed at the events that were to transpire as a result of the music recorded that day. The girl's hadn't been playing very long and were uncertain of their abilities. Upon hearing the three sisters play, the recording engineer suggested to Austin that perhaps the girls weren't quite ready to record. But Austin Wiggin, Jr., a true visionary, was intent on capturing the moment. "I want to get them while they're hot," he reportedly said. 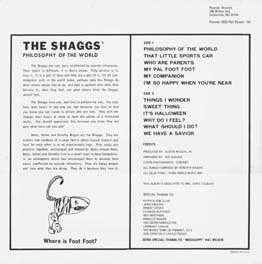 The music recorded that day was indeed hot, and Austin paid a local entrepreneur to release Philosophy Of The World by the Shaggs on the Third World label. The "entrepreneur," however, disappeared with Austin's money and most of the albums that had been manufactured. If ever a record was doomed to obscurity, this one seemed to be it. What copies of Philosophy Of The World did survive miraculously found themselves into the right hands. WBCN-FM in Boston played selections from Philosophy several times; local musicians like Andy Paley discovered the record and began championing the Shaggs; someone at WBCN played Philosophy for Frank Zappa, who was quite taken with it; and finally tenor saxophonist and composer Keith Spring, then playing with the Whole Wheat Horns, an adjunct to the legendarily adventurous NRBQ, played a tape of the Shaggs for the rest of NRBQ. Shortly thereafter arrangements were made to reissue Philosophy Of The World on NRBQ's own Red Rooster label, distributed by Rounder Records. Perhaps no album, either prior to or since, has generated as intense a reaction as Philosophy Of The World did upon its reissue. Most critics loved it, although their reasons varied greatly. Some thought the Shaggs were a joke, or some elaborate hoax. Debra Rae Cohen in Rolling Stone (which cited the Shaggs as the Comeback of the Year band in their 1980 Rock & Roll Awards) said, "I'd call Philosophy Of The World a work of primitive American genius but I'm too busy rolling on the floor." Others took the Shaggs more seriously. 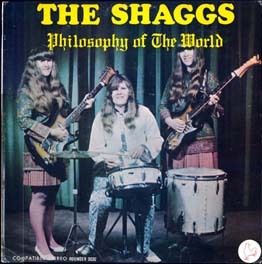 Bruce D. Rhodewalt in L.A. Weekly said, "If we can judge music on the basis of its honesty, originality and impact, then the Shaggs' Philosophy Of The World is the greatest record ever recorded in the history of the universe." And Op magazine said, "The Shaggs integrity and purity of vision shine through like a 50,000-watt lighthouse ona stormy night. Listen to the record. It will change your life." It's easy to see how someone could have been confounded by this wondeful music. Here were three teens playing instruments we've heard countless times, but this time with none of the familiar signposts--none of the standard rhythms or chord progressions we've come to recognize and, yes, even expect. On the other hand, listening to this music without preconceptions or expectations reveals a refreshingly playful, yet decidedly structured sound with its own complex inner logic. "I have yet to play a Shaggs cut for a professional musician who didn't roll his eyes and whisper, 'Where can I get this record? '," said Dan Forte in The Record, and no wonder. The compact disc, which contains all previously issued Shaggs material and two new items, offers the listener--whether familiar or new to this music--the best-ever opportunity to appreciate the Shaggs. For one thing, the music itself has never sounded as good as it does [on the CD]. Not surprisingly, the original Third World release of Philosophy was neither mixed nor mastered in the most highly attentive fashion. And since the original master tapes were believed to have been stolen from the Wiggin residence, the Red Rooster/Rounder reissue had to be painstakingly transferred from a clean copy of the original release. Recently, however, Terry Adams of NRBQ was speaking to Dot Wiggin on the phone when she mentioned that she had come across some "big tapes" while going through a closet in her home. It was soon discovered that the "big tapes" included the orginial multi-track recordings of Philosophy Of The World. Now newly mixed and mastered, with errors in pitch and speed finally corrected, and aided by the full-range, compression-free compact disc medium, this definitive version of Philosophy reveals a cleaner, yet wonderfully bracing quality that will surprise even those already familiar with its contents. Each instrument has a spatial and sonic heft to it, and there are other surprises as well. A bass guitar, omitted from the original mix pf "That Little Sports Car," has been restored, adding a whole new dimesion to that song. Also heard for the first time is a pre-take run-through of "Who Are Parents." The CD will also give listeners another chance to evaluate the somewhat less-heralded Shaggs Own Thing, which contains material recorded after Philosophy that was compiled and released after that record's triumphant reissue. Perhaps both the slightly less abstract quality of these later compositions, and the fact that the Shaggs were presenting their own unique interpretations of other people's songs, confused those who were expecting a carbon copy of Philosophy. For me, Shaggs Own Thing reveals these remarkable youngsters, this time aided by youngest sister Rachel on bass (with guest appearances by brother Bob and Austin Wiggin, Jr.), relentlessly pursuing their refreshingly unaffected artistic vision with sincerity and creativity. Especially delightful is the mature, almost sensuous remake of "My Pal Foot Foot"; Dorothy Wiggin's exquisite adolescent reverie, "My Cutie"; and Betty Wiggin's only known composition, "Painful Memories," which Dorothy embellishes with some inspired whammy bar chording. And there's also a previously unreleased original composition, "Love At First Sight." The Shaggs originated almost twenty years ago. As mass media increasingly permeates our society with a sameness that is frightening, it seems unlikely that another band of this kind of quality and originality will ever come along again. Or maybe in some distant country, as you read this, a proud father is giving his daughters (or sons) instruments and is exhorting them--in whatever language--to "do your own thing." Whatever the case, the Shaggs did their own thing and we have an eloquent reminder in these awe-inspiring recordings.